Of course, it’s entirely possible that Ryan’s proposal could end the Medicare guarantee—that, if implemented, some seniors might not be able to get comprehensive insurance. But that’s pretty much the way the Medicare debate in this campaign has unfolded. Ryan and Mitt Romney have called for the most profound, radical changes in the program’s history. But rather than clarifying the differences between their position on Medicare and President Obama’s, they’ve done their best to obscure them. They’ve accused Obama of “raiding” Medicare when Ryan’s own budget calls for reducing the program’s funding by the same amount of money. They have insisted they won’t do anything to affect current retirees, even though they have pledged to repeal the Affordable Care Act, which bolsters Medicare’s drug coverage and makes preventative care available without out-of-pocket expenses. Romney and Ryan have also been less specific than you might have heard. That’s particularly true for Romney, whose “proposal” consists of a fact sheet, plus a few speeches, statements, and op-eds. This allows them to escape responsibility for the inevitable trade-offs that their vision, like every effort to reform Medicare, would require. And it gives them a political advantage over President Obama, who must defend reforms of Medicare in the Affordable Care Act and his latest budget—right down to the last legislative clause and dollar figure. Yes, I keep reading that Romney and Ryan have been “brave” and “serious” about Medicare, while Obama has ducked hard choices. I would say it's the other way around. The public deserves a better debate than this. Medicare occupies a special place in the American welfare state. In the U.S., the purpose of most government programs is merely to offer assistance. You can’t afford food or housing? OK, here’s some money to help you pay for your grocery bills or cover the rent. Medicare is much more than that: It’s a promise that, upon reaching 65, you will be able to get medical care without risking financial ruin. That makes it more like Social Security, which guarantees a pension to everybody in retirement, or public schools, which guarantee an education for all children. At the same time, Medicare really does place a big strain on the federal budget. And it’s going to place an even bigger strain in the future. If current trends continue, the government will eventually confront a set of unpleasant options if it wants to keep the program’s promise to seniors: It will have to raise taxes, cut spending elsewhere, or cope with even higher deficits. Very few Americans would want that. Figuring out how to get out from under Medicare’s financial burden, while still protecting seniors, represents a genuine challenge. Obama has in mind one way to deal with it, Romney and Ryan another. What follows is an effort to explain the basics of those two approaches, extrapolating as best I can from what Romney and Ryan have said they intend to do. And since you might not want tto read the whole thing, I’ve summarized the essential points in a chart at the bottom of the item. By the way, I’ve submitted questions to the Romney-Ryan campaign, trying nail down some of the most important details. If I get answers, I’ll let you know. 1. 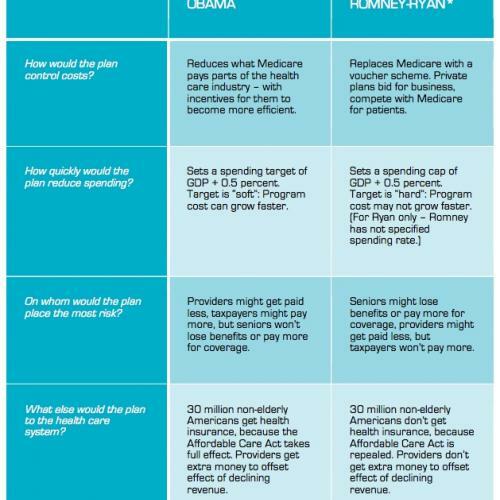 How do the plans control Medicare spending? It’s easy to forget, but presidents were "cutting" Medicare long before Obama and Romney came along. Ronald Reagan, George H.W. Bush, and Bill Clinton all presided over reductions in what Medicare paid providers—that is, doctors, hospitals, and suppliers of medical goods. The Affordable Care Act adopts the same approach. But rather than simply reducing payments across the board, it also targets areas where evidence suggests that Medicare is overpaying for services and introduces incentives designed to promote better quality care. So, for example, it pays less to the insurers providing Medicare Advantage coverage, because studies have shown the government has been paying them too much. And it penalizes hospitals with high rates of inpatient infection, giving hospitals a powerful reason to be more careful with their patients. The Affordable Care Act also creates a board of experts, appointed by the president, to make recommendations on further cuts whenever the overall cost of Medicare grows faster than a pre-set spending target. The law explicitly prohibits the commission, the Independent Payment Advisory Board (IPAB), from reducing coverage, raising premiums, or making other changes that directly affect beneficiaries. This is a really important distinction, for reasons we’ll discuss shortly. The conservative approach to controlling costs focuses on competition. If more individual seniors were actively shopping for insurance options, the thinking goes, seniors would become more cost-conscious and insurers would compete for their business—by promising lower prices, better services, or some combination of the two. The value of the voucher would be equal to the second-cheapest plan in each marketplace, which might (or might not) be the traditional Medicare plan. Romney and Ryan have said all private plans would have to provide coverage as good as what traditional Medicare provides, although they have not indicated whether they are prepared to endorse the steps necessary to make that promise a reality. Generally speaking, which approach is preferable? Conservatives say that traditional Medicare has not controlled costs sufficiently, given that the program’s financial future remains so daunting. And without government meddling so much in the market, they say, private plans would be free to bid down premiums—making insurance more available to everybody. They also warn that the more traditional approach to controlling cost, ratcheting down what Medicare pays providers, could cause doctors and hospitals to see fewer patients. Something along those lines has happened to Medicaid: The program pays physicians so little that many won't take new Medicaid patients. But doctors and hospitals could react the same way if private plans pay them less. And the evidence that competition can reduce Medicare costs more quickly, or with fewer repercussions, is thin at best. Among other things, Medicare has enormous economies of scale, including very low overhead. Current projections suggest that, as a result of the Affordable Care Act's changes, the cost of Medicare will grow more slowly than the cost of private insurance on a per capita basis for the next decade. If the law's payment reforms induce the health care industry to deliver care more efficiently—and there are early, though very limited, signs that might be happening—the savings should be even larger than the official projections suggest. Turning Medicare into a more wide-open marketplace also asks a lot of seniors, many of whom may not be up for it. As my colleague Tim Noah pointed out last week, nearly 30 percent of all seniors have cognitive impairment, making them easy targets for exploitation and fraud. And even seniors without cognitive impairment may not have an easy time navigating the private insurance marketplace: Studies of the Medicare drug benefit, which already has a similar competition scheme, suggest that seniors have generally not chosen the plans that best match their needs. One final note: Romney and Ryan say that their proposals would preserve traditional Medicare as an option for anybody who wants it. But, as Peter Orszag wrote last week, private plans frequently save money by seeking out the healthiest customers, who cost less to insure. This creates potential for “adverse selection”—leaving Medicare with less healthy beneficiaries, driving up its costs, and leaving it less attractive to younger, healthier seniors. If that happened, Medicare could "wither on the vine," as Newt Gingrich famously put it during the 1990s. By the way, these two versions of cost control, government administration and competition, are not mutually exclusive. As a matter of fact, the existing Medicare program already has some competition: Today, seniors have the option of enrolling in “Medicare Advantage” plans that offer at least the same package of benefits, and usually some extras. Government manages that competition aggressively—too aggressively, according to conservatives. But without that oversight, the competition could go awry, in ways that could leave the poorest and sickest seniors without the protection they need. 2. How quickly do the plans cut spending? Let’s talk about that $716 billion that the Affordable Care Act takes out of Medicare spending in the first ten years. More important, let’s put that figure in context. Seven-hundred and sixteen billion dollars is a lot of money. And it’s supposed to be! A major goal of the Affordable Care Act is to ease the strain Medicare will put on the federal budget. But, relatively speaking, the Affordable Care Act’s cuts are smaller than the cuts that were in the Balanced Budget Act of 1997, which Clinton signed and which a Republican Congress enacted. Romney, Ryan, and their allies have made this cut the main focus of their attacks, accusing Obama of “raiding” Medicare. It’s difficult to overstate the hypocrisy of this attack. 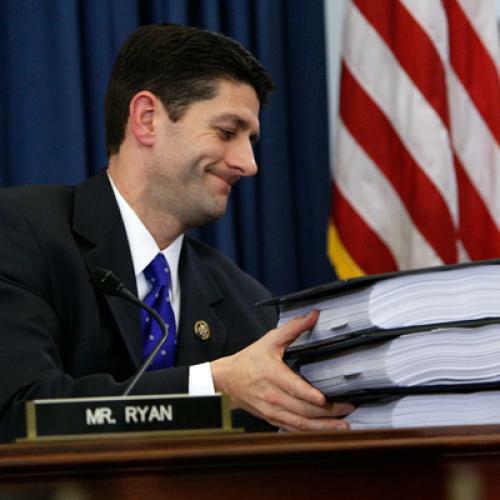 Both of Ryan’s budget proposals called for cutting the exact same amount from Medicare. Romney has pledged to undo those cuts, but if you examine his overall budget framework—in particular, his promise to cap non-defense federal spending at 16 percent of gross domestic product—doing so would be virtually impossible, at least without even more implausible cuts elsewhere. Ryan has since said he, too, supports undoing those Medicare cuts. But that doesn’t fit his budget particularly well, either. But let’s put that issue aside and focus on what would happen after the first ten years. In the competition schemes conservatives that favor, program costs would rise at a fixed rate. That means the voucher's value would increase according to a predetermined formula, and in the original Ryan budget that formula would have resulted in dramatic funding cuts. By 2030, according the Congressional Budget Office, the skimpy voucher would have left the typical senior individually responsible for about two-thirds of his or her medical bills. The new Ryan budget envisions a much less severe cut: Under that budget, the voucher would increase at the same rate as gross domestic product, plus half a percentage point. CBO has not revised its estimate of how that would affect individual seniors, but the growth rate is the same as the target Obama proposed setting with his latest budget (which calls for reducing costs slightly more aggressive than the Affordable Care Act originally did). Romney has not said, specifically, how fast the voucher would grow under his scheme. And, again, it’s safe to assume this is a deliberate dodge. If he came up with a growth rate, forecasters would crunch the numbers and come up with projections of what it would mean to individual seniors. But one thing we know is that Romney’s spending cap leaves even less room for domestic spending than Ryan’s budget. That makes it quite likely that Romney’s plan, if taken at face value, would entail a more severe spending cut than Ryan’s or Obama’s. 3. On whom do the plans place the most risk? This is probably the most important issue in the entire debate. And it’s really an argument over what kind of guarantee Medicare offers. The Affordable Care Act alters the way Medicare pays for services. But it does not undermine the basic guarantee to seniors—that, upon retirement, every American will get a comprehensive set of insurance benefits. The Republican voucher schemes wouldn't make that guarantee. Their guarantee would be to the government and, by extension, to the taxpayers: It'd be a guarantee that the program’s cost will not exceed a pre-determined amount. Maybe the easiest way to think about this is to imagine what would happen if either set of proposals failed to control health care costs as their architects hope. In other words, let’s assume that the cost of medical care for the elderly keeps going up, beyond the target that both Obama and Ryan have endorsed (GDP plus a half a percentage point). Under Obama’s proposal, the IPAB would make recommendations for reducing the program’s spending. It would probably do so by reducing what Medicare pays providers of care. But, again, the law prohibits IPAB from cutting benefits and does not require IPAB to reduce spending by enough to meet the spending target. As a result, the program could end up a little growing more quickly than the spending target. That would force the government to accommodate that higher cost—by raising taxes, cutting spending somewhere else, or tolerating higher deficits. The Romney and Ryan proposals are a lot less specific about what happens if spending exceeds the growth rate. And the latest Ryan proposals, including not just his budget but the policy paper he wrote with Senator Ron Wyden, would give Congress an opportunity to alter the program’s payments, apparently in a similar way that IPAB could. But the Ryan budget does not protect benefits explicitly. Romney has not made such a guarantee, either, despite what you may have heard. Without such a guarantee, seniors might have to make up the difference between the value of the voucher and what it costs to buy a decent insurance policy. While both sides set targets to constrain the growth in Medicare spending, they do so in very different ways, with important implications for beneficiaries. Under the health reform law, the IPAB is explicitly prohibited from making changes that would increase premiums or cut benefits for seniors. No similar restrictions are included in the Ryan proposals. So under Obama’s proposals and the Affordable Care Act, providers and the public as a whole bears the risk of higher costs, as they always have with Medicare. Under the Romney and Ryan proposals—again, based on what we know about them—individual seniors could end up bearing the risk. Which approach you prefer is a matter of philosophy and values. But they represent very different commitments. 4. What else would the plans (and the men behind them) do to the health care system? We’ve been talking a lot about Medicare and very little about Medicaid. That’s a mistake. The changes to Medicaid that Romney and Ryan have endorsed are actually more drastic than what they have in mind for Medicare. And those cuts to Medicaid would end up affecting seniors on Medicare, both directly and indirectly. Romney and Ryan say Obama “raided” Medicare to pay for Obamacare because, in effect, the money that's coming out of Medicare will help finance the Affordable Care Act. But that money still helps seniors. A small portion improves Medicare benefits directly, by giving seniors more help with prescription drugs and providing free preventative care. The rest helps to stabilize the health care industry, so that it can tolerate and adapt to the law’s Medicare cuts without reducing services and causing shortages. That infusion of money from Medicaid and private insurance tax credits is the reason that the major health care providers (doctors, hospitals, drug makers) went along with the Affordable Care Act in the first place. Both of Ryan’s budgets call for massive cuts to Medicaid. Romney’s tight spending cap would require cuts as severe, and possibly more severe, than the ones in Ryan’s proposals. Independent analyses, including one from researchers at the Urban Institute and the Kaiser Family Foundation, suggest that between 14 and 27 million people on Medicaid could lose their coverage—above and beyond the 17 million who would lose coverage because both Romney and Ryan would repeal the Affordable Care Act. Dumping between 14 and 27 million uninsured people on the health care system would have a devastating impact on doctors and hospitals, forcing them to dispense a lot more charity care and affecting their ability to provide care for everybody else. The researchers from that Urban-Kaiser study made one key assumption: That, confronted with insufficient funding, states would react entirely by reducing services or eligibility for the non-elderly. But most of the money that Medicaid spends goes to the disabled and the elderly. A huge chunk of that goes to nursing home care. States would almost surely make some cuts to their services, too. In that sense, cuts to Medicaid would almost surely hurt seniors directly, and not just indirectly. Those cuts, if enacted, would produce real budget savings. It’s one reason that, on paper, the Ryan and Romney would appear to save the government a lot more money on health care than the Affordable Care Act will. But the cuts would have dramatic, devastating effects—on seniors, among others. My Bottom Line: Transforming Medicare into a voucher scheme is not a crazy idea. Smart conservative economists like Joe Antos and Gail Wilensky believe it’s the best way forward. They make a reasonable case and there are versions of premium support that many liberals (including this writer) could support, particularly if it were part of a bigger compromise on health care and spending. But the plans that Antos and Wilensky envision would include careful regulations and protections that, so far, Romney and Ryan have not endorsed. And they couldn't possibly work in a world where the Affordable Care Act came off the books and Medicaid, as we know it, ceased to exist. although it’s true that Medicare is a key driver of long-term federal spending, we don’t believe that recently proposed premium-support reforms are the solution. They lack safeguards for beneficiaries. They threaten to shift costs to the elderly and disabled and force them to shop for coverage in a confusing insurance market. Aaron was an early supporter of premium support back in the 1990s, when the idea first appeared on the national agenda. If he’s changed his mind about the idea, at least in the current political context, that tells you something. Author’s Note: Blog items don’t usually include bibliographies, but I want to mention a few sources that were particularly helpful—starting with a Kaiser Family Foundation side-by-side comparison of voucher plans and a Center on Budget and Policy Priorities analysis of the Romney budget proposal. I also learned (as I always do) from experts at both institutions, as well as writing by Aaron Carroll and Sarah Kliff, plus ongoing Medicare coverage in Health Affairs and the New England Journal of Medicine.